This Tiny Home Won The “Best Small Home” Award 2015, And When You See The Tour, You’ll Know Why! This home is listed as being only 550 square feet, but it feels like it’s much bigger, inside and outside! The gorgeous big windows, the stunning view, this home, located on Lake Pend Orielle in the Idaho panhandle, is definitely deserving of the 2015 Best Small Home reward from Fine Home Building! Looks Like She’s Just Opening A Cabinet, But What She Reveals? INCREDIBLE! 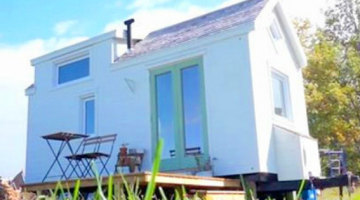 They Built Their Tiny Home In 40 Days. You’ll Definitely Love What’s Inside!